So begins this stunning picture book from Magabala Books that is sure to leave you in quiet awe. A group of desert children, who live in 'higgledy-piggledy' houses with 'higgledy-piggledy' gardens, invite their school teacher, Mrs White, home for dinner so they can show her why their homework is always grubby. 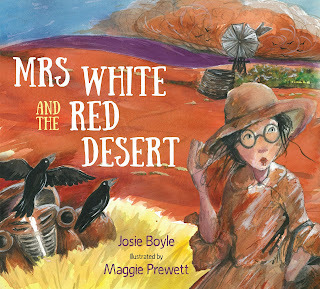 But when Mrs White arrives, in her hat and white dress, a sandstorm sweeps through the community, turning everything in its path red. Finally, Mrs White - now covered in red dust - can see why the children's homework is never clean. Poetic and vibrant, this indigenous tale is rich with delightful imagery, including the wavy, buckled house that was just like Grandma's hair and the rain on the tin roof singing the children to sleep. Every corner of this book is alive with colour, movement and detail, bringing the reader into the bold landscape. A simple use of contrasting colours (white and red) conveys a poignant message of different cultures and the beauty of understanding and acceptance. This is a truly captivating portrayal of Australian life for young children that is sure to resonate with readers long after the dust has settled.